Local descent groups are associated with a tract of land, and people in such groups have rights in the land and in ceremonies and symbols. The people in such LDG’s inherit these rights from previous generations. Social categories (skins) on the other hand do not have such an association with a tract of land: members of a skin category are distributed through various local descent groups. It is common for people to have a connection to clan country through other lines in addition to through the father. Most common is the connection through the mother’s brother (‘uncle’) and the mother’s father, sometimes the mother’s mother. In some areas people may be affiliated to a clan through other connections such as ‘conception dreaming’, birth place and other life events of the individual or their parents, but in other regions the importance of such ties is minimized or dismissed. A Clan is a group of people, or a number of lineages, whose members claim to be descendants of a distant ancestor. However in Australia it is not always, or commonly, the case that totems or dreamings (mythical figures often with the names of animals) are the ancestors of the current and former clan members. They generally created sites in the land, the names of the sites referring to events told in songs (‘songlines’) used in ceremonies. Lineage: A group of people who can trace their descent back to a single known and, in most cases, named human ancestor. Lineages can be branches of clans, but the exact genealogical connection between the lineages in a clan may not be known. Specific clan groups are made up of members of one moiety, two specific sections or two specific subsections. We begin with how a Warlpiri person, Steve Jampijinpa Patrick, explains this, and use the colour scheme that was designed for the Milpirri ceremony at Lajamanu. We had four [Jukurrpa-Dreaming] stories, each told four different ways. We then assigned colours for each of the clan groups so that the individual groups could be easily identified from the audience. Blue was assigned to the Jangala/Jampijinpa clan, because many of the Jukurrpa stories in that clan are ngapa (water) stories. We assigned Green to the Japanangka/Japangardi clan because many of their Jukurrpa stories are about vegetation. The Jakamarra/Jupurrurla clan was assigned red because many of their stories are about animals that are eaten as meat. Because the Japaljarri/Jungarrayi clan has many bird stories, we assigned them the colour yellow. It is amazing, but despite never having been part of the Warlpiri culture, these colours have been integrated to such a degree that it is as if it they always were a part of Warlpiri culture. There are several clans of each type, an important one of the blue jangala-jampijina type being the ngapa (rain) dreaming in the Tanami Desert, to which Steven Patrick Jampijina belongs. Another member was the artist Peggy Nangala Jurra, who painted this picture of the dreaming country. Jangala and Nampijinpa are different generations in the same clan. Here is a description of the painting from National Gallery of Victoria. Parardi (Rainbow) Dreaming is associated with the ngapa (water) Dreaming that also belongs to Nangala and Nampitjinpa women. The country of the Dreaming is Puyurru where a big rain left to travel north in the Jukurrpa (Dreaming). As the rain travelled, the Dreaming created people out of the milpirri (small rain clouds). The clans here are patrilineal. That is, they follow the father line. So a Nampijinpa could be a father’s sister (pimirdi) to a Jangala who is her brother’s sister (ngalapi). North of the Warlpiri are the Gurindji and Mudburra who have skin names similar to the Warlpiri. Listen to how they sound. Janama Your browser does not support the audio element. Jurlama Your browser does not support the audio element. Nanaku Your browser does not support the audio element. Nawurla Your browser does not support the audio element. Jungurra Your browser does not support the audio element. Jangala Your browser does not support the audio element. Namija Your browser does not support the audio element. Nangala Your browser does not support the audio element. Japarta Your browser does not support the audio element. Japalyi Your browser does not support the audio element. Nimarra Your browser does not support the audio element. Nalyirri Your browser does not support the audio element. Jampijina Your browser does not support the audio element. Jangari Your browser does not support the audio element. Nampijina Your browser does not support the audio element. Nangari Your browser does not support the audio element. 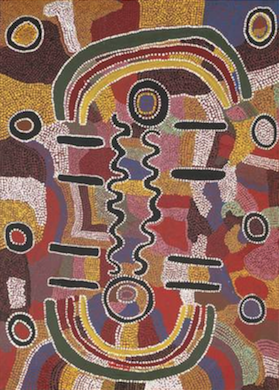 The same Rain Dreaming is found in Mudburra country (called Nguku there) also owned by Jangala and Jampijina. There are different clans along this dreaming track or song-line; the different clans ’hand over’ to each other as the song is performed. Semi-moieties are each, as the name implies, half of a moiety, but not in the same way as sections are. The patri-semi-moieties that are found in South-east Arnhem Land and further east on the Gulf of Carpentaria coast are made up of four units, each of which is a patrilineal phratry (group of clans). As such they each are associated as owners of an area of country. 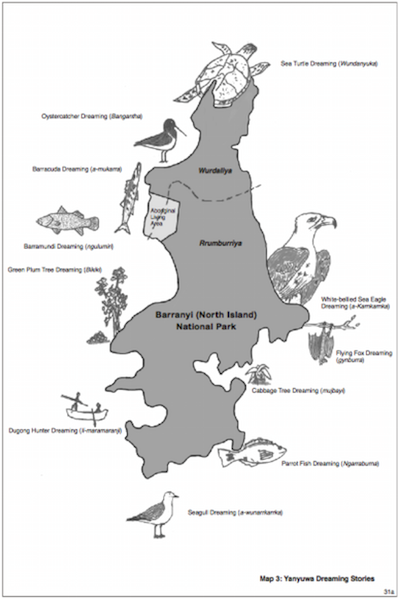 In the map below it can be seen that each of two of the Yanyuwa semimoieties, Wurdaliya and Rumburriya own a different part of an island, which contains sites of the dreamings with which the clans in each semi-moiety are associated. However there is an additional feature which distinguishes semi-moieties from plain phratries. There are marriage rules between the semi-moieties – one semi-moiety may only marry one particular other semi-moiety (or sometimes there is a second marriage option). In this way they are like social categories (sections and subsections). In most clear cases of semi-moieties, subsections are also found in the area and there is a straightforward mapping between the two: a semi-moiety aligns with two subsections which are father-son pair as in the case of the Warlpiri grouping of subsections.